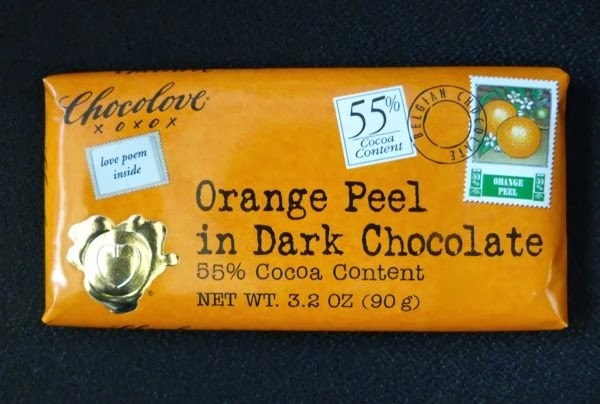 I opened the cheery orange wrapper, and the gold foil liner and broke off a piece of today's Orange Peel in Dark Chocolate bar from Chocolove (Boulder, CO). I could smell dark chocolate and a faint whiff of orange. The 55% semi-sweet, Belgian chocolate base was pleasant, and the orange peel bits tasted natural, and were small enough to impart a nice, uniform citrus accent flavor. I enjoy a bar that inspires. And, I could see eating this bar plain, or melted with a bit of Cointreau and added to a vanilla ice cream sundae, or blended into chocolate orange souffle. All attractive possibilities. To paraphrase the John Keats poem* printed on the inside of the wrapper: "A thing of beauty (or a good bar of chocolate) is a joy forever...Its loveliness increases..."
*Chocolove chocolate bars come with love poems inside the wrappers.